In this article we will learn project folder structure of Angular 5 and how to set up your first Angular application. 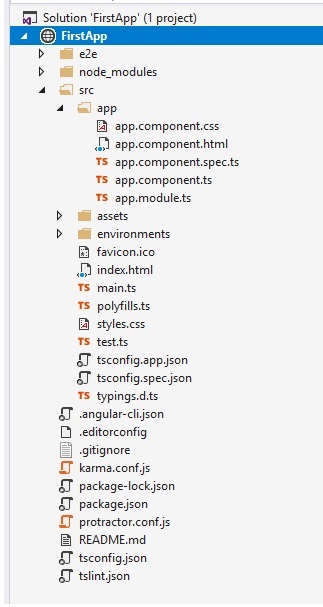 Open folder from your drive and open command prompt from that folder and type the below command which will create a New Angular project with folder structure like the image given below. Make sure you have installed npm. Stands for end to end, also known as integration testing. It helps to test wheather our components are working correctly together or not. Angular CLI includes unit tests. e2e tests are powered by a testing library; i.e., Protractor. 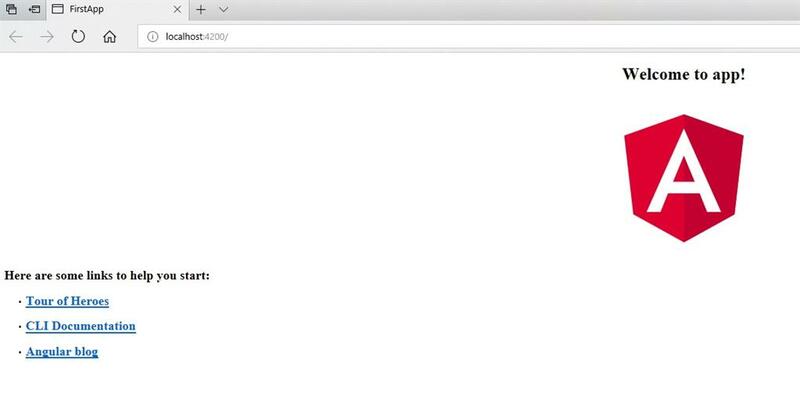 User can can test scenarios on browser. Options supported by ng serve are also supported by ng e2e, like config, element-explorer, serve, specs, suite, webdriver update. Here you will get all third party libraries on which your application is dependent. Contains the actual source code. User can develop their own application in src/app folder which is root folder. This folder contains modules & components. app.component.css - component CSS file, contains style sheet. app.component.html - This is component template file, used as a master page. User can add header, content placeholder, footer into it. Here user can import files as per syntax given above. Component section defines the selector, template and style location, default selector is 'app-root' which is definded in index.html. Template URL contains component html file name and style URL contains style sheet . Every application has one root component. Here app component is root component. Top level module configuration file. This file is used when you are creating a your first app. By using bootstrap: [AppComponent] default component gets loaded. Store configuration settings for different environments. There are two files in this folder. // The file contents for the current environment will overwrite these during build. // `ng build --env=prod` then `environment.prod.ts` will be used instead. // The list of which env maps to which file can be found in `.angular-cli.json`. Imp - The build artifacts will be stored in the dist/ directory. index.html - Contains our application file which cannot have any references of style sheet references or any script references. This is the standard configuration file of your application.